Posted on September 26, 2014 at 4:11 pm. Yasodhara Ashram reminds me right now of a yogini at her flexible best – stretching some people into new positions, swiftly sending others flying off to next steps while welcoming old friends into long, extended stays. She is as transient as the weather – drawing us close with warm affection then storming up challenges to shake us awake. And so we question: What is Yasodhara Ashram now? Where do we expand? Contract? How is she showing the way? The season pulses the underlying rhythm of harvest and the hint of limits in time… “Do it now!” Women step up to deepen their connection and make the lineage strong. Teachers prepare to reach out, drawing others in. Guests and karma yogis enter questioning and leave practising. The Temple calls silently, waiting to inhabit its new form. As we pause for responses from architects, a local craftsman dreams up a simple dome (wood ribs covered in plastic, later to be a greenhouse) to over-winter the foundation and incubate ideas. Yasodhara moves freely and we are carried on her current, improvising to the rhythm of change in the world and in this place. And I wonder at her precision and abandon, and sometimes glimpse her luminous essence – immutable yet emanating momentum as she constantly renews. Living the Practice with Swami Radhananda: This special five-day yoga workshop is led by Swami Radhananda, author and spiritual director of Yasodhara Ashram. Swami Radhananda will help you explore how a life infused with practice and self-inquiry can become a life of meaning and potential. Discover Yasodhara: This program is a unique opportunity to experience yoga, work and community life at one of the most enduring spiritual communities in North America. Tools for Transformation Retreat: In this spacious retreat you will learn new ways to support yourself in making changes that reflect your ideals. Learn to use tools that will help you make key transformations in your life. 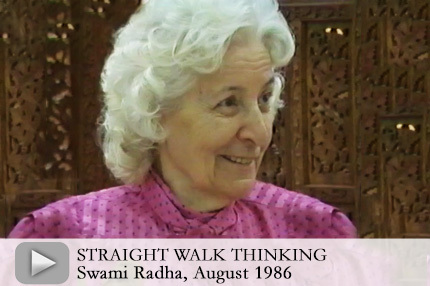 In this video from August 1986, Swami Radha discusses the Straight Walk, one of her signature workshops. 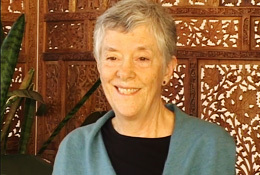 She passes on her original experience with Buddhist monks in Thailand in 1958, and points out the benefits of the workshop, which include thinking clearly and meeting challenges straight on. 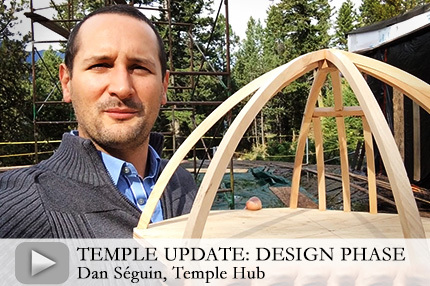 The Temple platform is clear and we are now into the design phase! Part of this phase is building a temporary structure to protect the floor. Watch our most recent update to learn more about upcoming steps. Also, this energizing phase inspired Tanin Shunter, a karma yogi and conscious hip hop artist known as Kosmic T, to compose and perform a second rap for the Temple. 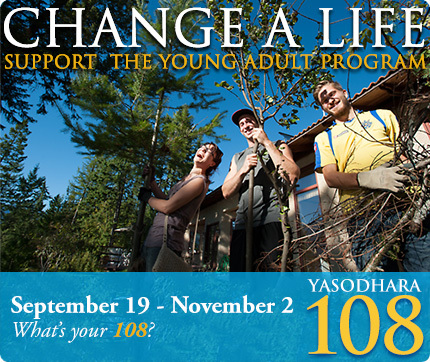 Join us in the second annual Yasodhara 108 fundraiser to support Yasodhara Ashram’s Young Adult Program. Help create a strong foundation for some very fine young people! This year’s goal is to raise $40,000 toward the program. To give context, last year the Ashram awarded $60,000 in bursaries to help young adults participate in courses, including the YDC and teacher certifications, and to help those with limited funds attend one-month Karma Yoga programs. Everyone is invited to join. Be inspired to offer 108 of any practice that is meaningful for you and ask your friends to donate to your cause. You have until Sunday, November 2nd to do it! Check out the innovative 108 choices of our enthusiastic participants so far. Examples include pulling 108 invasive weeds a week around the Ashram, exploring trees daily through photographs, drawing and asana practice in a “tree-vaganza,” writing 108 poems, creating 108 drawings, taking 108 photographs – all by November 2nd. You can donate to any of these participants and help them meet their personal financial target. Learn more, participate or donate! Meet your own challenge and support young people in changing their lives! From October 18 to November 2, Swamis Samayananda and Matananda will be offering workshops in Halifax, Ottawa, Toronto, Orangeville and Montreal. Both teachers will contribute to the first residential weekend retreat, “Stilling the Mind,” at the Ecology Retreat Centre in the beautiful Hockley Valley, 45 minutes north of the Toronto airport. Accommodations and meals are included. This is a wonderful opportunity for those in the East to experience an Ashram environment much closer to home. Alicia Pace will be presenting “Exploring the Spiritual Space Within” at a conference at Columbia University in New York, October 24. She is also offering “Building Awareness in Navigating Conflict,” a Yasodhara Institute workshop, in Boston October 28 and Spokane November 1. Visit the Yasodhara Institute website for more details. 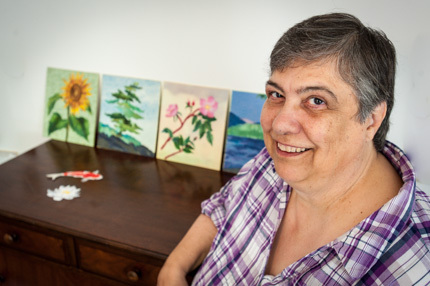 More locally, Padma is leading short workshops in Cranbrook and Lethbridge, as well as at Selkirk College locations in Castlegar and Nakusp. If you are interested in a workshop in your area or can suggest a conference for our involvement, please e-mail outreach@yasodhara.org. Visit the Outreach page to see all the fall offerings and get details about each workshop. With Chigiri-e, colors flow and change every time you add another layer. 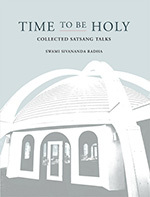 I found it is similar to Yasodhara Ashram’s focus on personal reflection that deepens through the layers. My artwork was a good fit with the Hidden Language Hatha Yoga and Karma Yoga that help build a harmonious environment and foster creativity. Hidden Language, with readings and questions, encouraged me to focus inwards and think about my life. It deepened my reflection on my own well being. And Karma Yoga kept me grounded, providing a balance. I was supported in the Light while I was here… it was excellent. I appreciate that at this Ashram everyone is welcome for who they are right now, and it moves forward from there. That is a very powerful acceptance. Is an Artist or Professional Retreat just what you need? 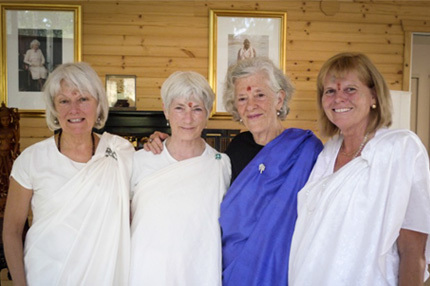 Learn more about Retreats at Yasodhara Ashram. 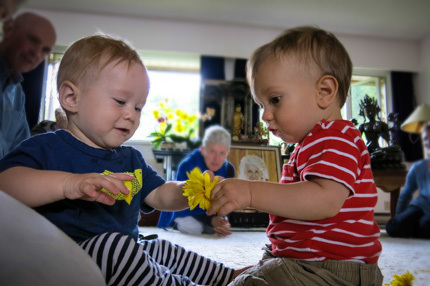 Our community shared in the joy of two babies this month when the swamis gathered to bless Edwin Elder Paquette and Lucien Bruyère French, both ten months old. Harvest Program Opportunity – At this time of abundance, October’s One Month Program is focused on the harvest. 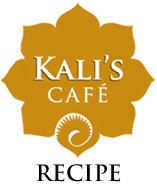 Join us October 6 – November 3 to help in our garden, orchard and summer kitchen, as well as in other areas of the Ashram. Learn about yourself, selfless service and living in community. Click here to read more and to register. 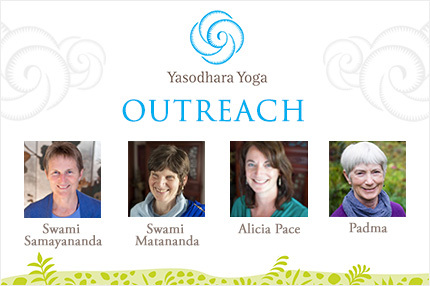 If you are an experienced Yasodhara karma yogi, come for whatever time period you can offer. Contact Registrations at registrations@yasodhara.org. Community Classes – Our fall session runs from Wednesday, October 1 until Wednesday, November 26. Drop-in Hidden Language Hatha Yoga 6 – 7:30 p.m. Dream Yoga 7:45 – 9:15 p.m. runs for eight weeks. Contact Registrations to sign up or register in person. Visit our website for more information. Live Satsang – Join us in October for Satsang live from the Ashram. This is offered instead of a fall Bhajan Blast as a way of coming together in devotion and to share what is happening here. Date and time will be announced soon. In the meantime, go online to watch previously recorded Satsangs and Bhajan Blasts. Gurudev Birthday Celebrations – On September 8th we came together on the foundation of the Temple to honour Gurudev Sivananda’s birthday and to offer our promises to the lineage. Together we danced and did the Light. Traditionally a day of initiations at Yasodhara, you can ask yourself, What am I initiating at this phase in my life? Fall Fair Winners – Yasodhara Ashram attended the Kootenay Lake Fall Fair where our team of chefs Steve Kruse and Garry Sly and Paris Marshall Smith won the Iron Chef competition. The Ashram Garden and Preserving Kitchen won eight 1st-place ribbons, five 2nd-place and four honorable mentions; and the hens picked up a 2nd place for their gorgeous eggs. Entries were auctioned off to raise funds for next year’s fair. In this video from March 2007, Swami Radhananda speaks about transition and how the spiritual practices and awareness can help bring meaning and joy into our lives. Swami Radha, using the symbol of the Tibetan drum (the damaru), challenges us to reflect deeply about time and our choices. Reflection QuestionsSeptember marks the change of seasons, the end of summer, the start of something new. This month we are focused on time and transitions, as well as exploring ethics that carry us steadily through the phases of our lives. Reflect on the time and seasons in your life, in the Tree Pose. How can you become aware of life span, continual growth, integrity and silent giving? How are you sustained by life? For what purpose? What’s ending? What are you moving toward? What are the challenges? The opportunities? What do you need to learn? In the teachings of Patanjali’s yoga, the moral foundation or ethics come first for the yoga practitioner. Choose a yama and a niyama to reflect on for the month. Niyamas: cleanliness, contentment, austerity, self-study, surrender to the Divine.